Last week the Gamecocks secured their best position in the race for the SEC East. With a Georgia loss against Auburn and a Gamecock win against Florida, South Carolina is as close to the SEC Championship as they can get. With the team and fan’s hopes on Missouri losing to Ole Miss this Saturday or Texas A&M next week, the Gamecocks need to remain focused. While a Missouri loss will put them in the SEC Championship, a loss to Coastal Carolina this weekend will hurt football fans’ opinions of the program. With two non-conference games left in their regular season, the Gamecocks need to focus on one game at a time and let Missouri focus on Missouri. Although a loss to Coastal Carolina would not affect the team’s opportunity to play for the SEC Championship, here are a few reasons South Carolina needs to defeat Coastal Carolina. The Gamecocks currently hold the longest winning streak in a home stadium in college football with 16 home game victories. This season the Gamecocks haven’t suffered a defeat at home, but to continue their winning streak South Carolina will have to finish out their season with wins. With Coastal Carolina and Clemson both hosted at home, the Gamecocks will need to overcome the 10-1 Chanticleers on Saturday to continue their home game winning streak. With all hopes of playing for the SEC Championship lying in Missouri’s hands, the Gamecocks need to prove they are focused on their own season. While many fans and team players all looking to Missouri to lose to Ole Miss this week, the team will need to stay focused on their own match up against Coastal Carolina this week and leave Missouri to fate. By proving that their team is focused on one game at a time (and their game not Missouri’s) the Gamecocks can continue to build forward momentum and fan hype moving forward. Defeating the Chanticleers at Brice-Williams Stadium will build team morale and momentum moving into the big Clemson game and possibly the SEC Championship. A loss against a non-BCS school would hurt team moral and momentum and could change the attitude moving into the next games. This may be the most important reason the Gamecocks need to dominate on Saturday. With a win this Saturday, South Carolina will secure its 9th win for the 4th season in a row. This is big for the Gamecocks because prior to 2010, the team only reach 9 wins in a regular season twice. To continue their 9 wins a season streak, the team needs to stay focused and beat Coastal Carolina. 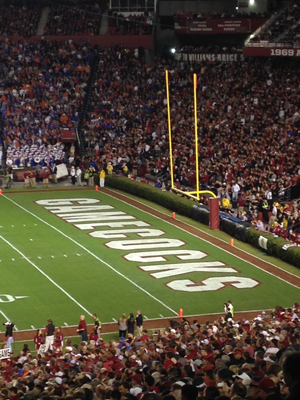 Coach Spurrier is 47-0 when it comes to non-BCS team match ups. In his 24 years of coaching, Spurrier has never allowed a team outside of the BCS to come out with a win. This Saturday the Gamecocks will take the field against the non-BCS Coastal Carolina Chanticleers. A win will uphold Spurrier’s winning record and save the Gamecocks from embarrassment. In the late 80s, South Carolina quarterback Todd Ellis set a school record for the most wins as a starter with 24 victories. This Saturday, Connor Shaw has the opportunity to break this record and set a new record with 25 wins as a starter. Shaw will need to stay focused and play his best in order to lead his team to victory against the five-time Big South Conference champions. With Clemson only a game away, the Gamecocks don’t need to give the Tigers any leverage in terms of team hype and confidence. A loss against Coastal Carolina could hurt the Gamecocks’ morale and coincidentally build up Clemson’s confidence going into the rival game on Nov. 30th.